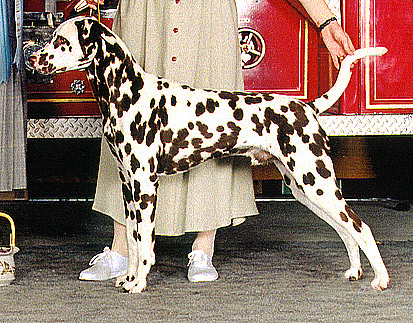 Out of our first home bred litter, Bear was our third champion, finishing with three majors. 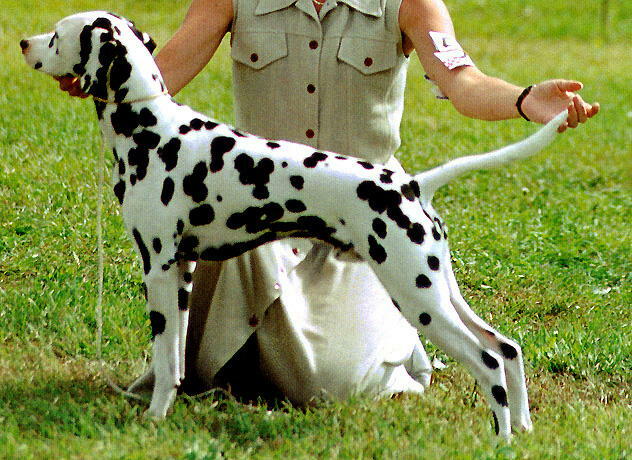 Two were five point majors; one at the Indianapolis Specialty under Dorothy Welsh, the other a Twin Cities Dalmatian club specialty weekend supported entry under breeder/judge Rod Strand. Along the way Bear also had major RWD awards at the St Louis Specialty under breeder/judge Bill Fetner and to his litter brother Ranger at Twin Cities under breeder/judge Patti Strand. Specialed lightly, Bear had multiple BOB wins and Group placements over nationally ranked, top ten specials. Shown only briefly in Canada, he finished 1997, ranked number 11. Bear sired one litter out of Am/Can Ch Skydel's N Bentley's Hardrocker Am/Can CD AX OAJ RD AgE FdCh aka Darby. From this litter, we got one Canadian champion and two American/Canadian Champions with multiple performance titles and another with 9 pts towards his Canadian championship. 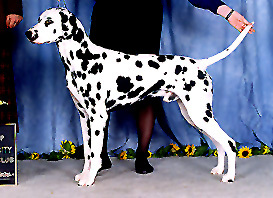 Breeder: Mary-Lynn Jensen, Ph.D. Owners: Mary-Lynn Jensen, Ph.D. & Kathy Mindick.